Call us on +91 7208060349 or +91 8983750838 for more information. The Abhisam IIoT & Digitalisation Workshop has been developed by industry experts, having cumulatively more than hundred man years of experience in Industrial Automation, Control Systems and Business Enterprise IT Systems. Learn from the experts and also get a Certificate of Participation, that will help you broadcast your skills to the world. This Samurai level workshop is not the run of the mill IoT hobbyist workshop. It is meant for industrial and business professionals who wish to come up to speed with this new technology. The workshop will be a blend of theory, hands-on exercises and interactive demonstrations of IIoT applications. 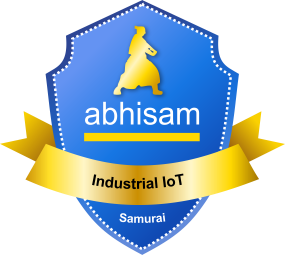 All attendees who participate in this two day workshop earn the Abhisam IIoT Samurai Badge. This badge can be shared online on places such as LinkedIN and Facebook. It is issued via Credly, the largest electronic badge issuer in the world. How is IIoT different from plain vanilla IoT? The Workshop will comprise of a team led by Mr. Anand Iyer, B.E. (Instrumentation) who has worked in various industries in India, the Middle East and the US in various areas and roles. He has more than 25 years of experience in Automation, Control and Safety Systems. His recent interests include developing solutions utilizing the Industrial Internet of Things. Certificate of Participation with a unique ID number from Abhisam.